Ralph Montgomery and daughters of Danville, Indiana, have returned to their home after a week’s visit to his mother, Mrs. Maggie Montgomery. William Mace of Virginia, is visiting friends here. A large crowd attended the “Old Settlers”. Mr. and Mrs. Ted Sipe, of Indianapolis, visited relatives here last week. Mr. and Mrs. Robert Hicks, of Chicago, are visiting her mother, Mrs. Mannie McCutchin. Mrs. Clara Hardy and family have moved to their country home south east of Lexington. Indiana became a state in 1816 and Scott County was formed in 1820. The first post office was established in Lexington with James Ward as the first postmaster. Lexington was the only post office in Scott County until, 1832 when a post office was established at Vienna, with Isaac Trumbo as the first postmaster. Lexington was incorporated by an act of the Territorial Legislature, at Vincennes, in 1815. Trustees appointed were Daniel Searles, Jacob Rhoads, James Ward, Samuel Patterson (1759-1823) and William Pringle. In 1813 Nehemiah Hunt made an addition to the town, which included the present day cemetery, and in 1814 he made another addition. In 1815 William McFarland, Adam Steele and Richard Steele made still more additions. Colonel William McFarland was born in Pennsylvania in 1766, son of Thomas McFarland. He came to Cincinnati where he married on September 15, 1799, Ann daughter of Jacob Singer. He came to Indiana Territory and became a “big wheel” in Lexington. He was a Justice of the Court of Common Pleas in 1810 and 1811, from which he resigned to serve as Territorial Representative at Vincennes from 1811 to 1813. He served as a Colonel of Militia during the War of 1812. He owned and operated the salt well on Town Creek, and allegedly became involved in he Indiana Manufacturing Company. He eventually, left Inidana in May, 1817, and later that year his lots in Lexington were sold for taxes. He died August 16, 1840, at Belgrade, Texas. In 1815 a bank known as the “Indiana Manufacturing Company” was established at Lexington. This was a notorious means of swindling the public for they issued bank notes without having the capital to back them up. 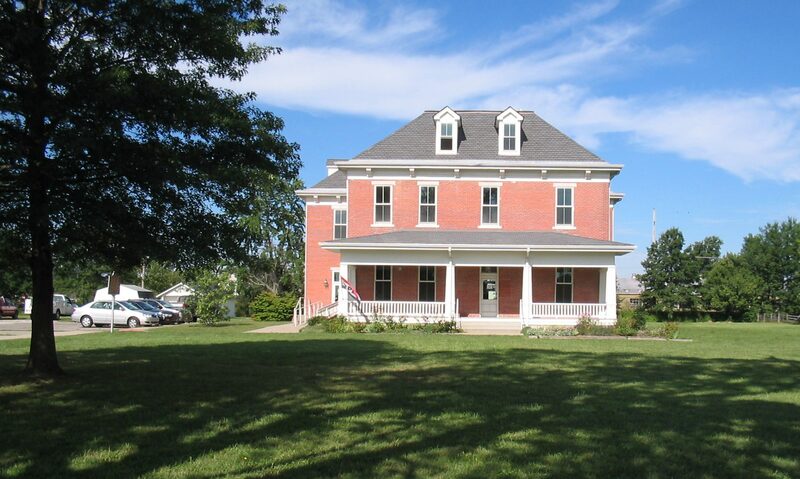 In 1817 the first school house in Scott County was built. In 1815 D. Shelburne owned and operated the Lexington Hotel, William Wales and John Maddox were blacksmiths, Benson White was a “taylor and mantu-maker”, George Strickland was a coach, house and sign painter and John Warnel ran a genral store. Another feature that made Lexington an important center was the salt spring on the New London Road, operated by Colonel McFarland, one mile east of the town on the bank of Town Creek (a branch of Stucker Creek). The brine from this spring was boiled down in hugh iron kettles and the resultant salt was sold for two dollars a bushel. Later a deep well was dug in order to acquire a larger supply of brine. The site of this old spring and well can still be seen today on the Howard Bridgewater farm. Above information extracted from The Early History of Scott County, 1820-1870 by Carl Bogardus, M.D. Lexington, Indiana is infested with wood thieves. The wholesale robbery of a half dozen wood sheds in one night is a frequent occurrence and the rich and the poor are losers alike. 3. For Life Work—the various Occupations and Professions. In actual operation 45 weeks each year. Appropriate Certificates of Graduation awarded. We met Marion McClain upon the street last Saturday, and he reports that the Lexington Collegiate-Institute—which he attends is in a flourishing condition. He said, “The attendance is now between eighty and ninety, and more will come in next Monday. We are having just a splendid time. Come up, and spend a day with us, you will enjoy yourself.” And a great many other like compliments. The fact is, the Institute, under the management of Principal Munden is just booming and bids fair to be among the best Institutes of the kind, in the State. Addison Wiggam is lying dangerously ill at the residence of a Mr. Horner near Lexington. A Mr. Massena removed from the vicinity of Lexington to this place (Scottsburgh), one day last week. Wm. Meloy has sold his market wagon to M V Getty. Some much needed improvements are now being made on the school premises in this place. A fine time is expected at the commencement exercises of the Normal-Collegiate Institute next Thursday and Friday. 1921 – The Lexington correspondent mentioned that the old school house bell had been removed from the position it had first occupied for more than 30 years, when the old school was rased. It was asked if it had been used originally in the first Scott County Courthouse, built in 1821, which had a belfry. (No answer). Floyd James and Tim Meagher exchanged cars last week — a Chandler for a Ford. Exchange fee not recorded. The still which Sheriff Robbins captured east of here and brought to town last week attracted much attention. It was of the old Irish Pot type and only 50 per cent efficient but seems to have delivered some goods at that. A modern still of the Corman type has an efficiency of 101 per cent. We are glad those milliners didn’t start that “new hat a month” slogan back when our wife was young, or we fear we would now be living in a large two-story brick building just south of Scottsburg instead of sitting in our sanctum sanctorium as staff correspondent. The town board will meet at the mayors office Friday evening to consider passing an ordinance against the parking of more than seven cows on the sidewalk within a single block in town. More than this number inconveniences the cows. Pedestrians will be instructed to use the streets as heretofore. We have predicted for some time that the old Cyclops truck, better known as Jumbo, would hit some one and it occurred last Friday night when it struck the buggy driven by Alva Clegg’s children, tearing three wheels from the rig and breaking the harness. These one-eyed monstrosities should be kept off the roads as it is impossible to tell how far into the road they extend or on which side of the road to try to dodge them. Ed Whitlatch and wife of Shreveport, La., are spending a few weeks with Charles Whitlatch and jethro Paswater and family. Oliver Mahan purchased a new ford runabout last week selling his old one, familiarly known as the “Little Fellow” to Jesse Amos. the latter has been on the stock route for 5 years. Mr. and Mrs. Monroe Summers of Oakland, Calif., are visiting his father and mother here. They are former residents of this place. Mr. Summers was here last summer but this is Mrs. Summers’ first trip back in 18 years. 1942 – Harry Eppley of Lexington had enlisted in the U.S. Army Air Corps, and was to be assigned to instructor’s duties at Rantoul Air Force Base in Illinois. 1957 – Mary Margaret Perrine of Lexington was guest of honor at a dinner at Buxton’s Cafe near Blocher. She was soon to leave for Tripoli in North Africa, where she was to teach in an American school for the children of U.S. Air Force personnel. SCOTT COUNTY JOURNAL, Scottsburgh, Indiana, Thursday Morning, 1895. Mrs. C.C. James of Nabb visited relatives here last week. The H.T.D.A. meets at the Hardy hall next Saturday at 2 p.m. All members are requested to be present. All the teachers of this township were present at institute last Saturday except Misses. Gladden and De Berry. John Hardy and wife and Alex. Amick and daughter Miss Carrie attended the funeral of Miss Anna Hennesy at Madison last Thursday. Lou Hardy attend the funeral of David Hedden at New Albany last Wednesday. Mr. Hedden was the oldest man in New Albany he being over 92 years of age. He was the father-in-law of F. R. Hardy formerly of this place.